For those who wonder.. yes, yes I'm running out of my holiday photo's of Laos. My holiday seems already a long time ago. Luang Prabang, does it still exist, or was it just a hazy dream I conjured in my imagination? Luang Prabang, the royal capital of the former kingdom of Laos, is a lovely quiet town. located between the two lazy rivers, the Mekong and Nam Khan river. Life flows slowly here, just like the muddy Mekong. The people are gentle and unassuming. Photo taken at the morning market of Luang Prabang. I fastly caught a glimpse of this old Asian man. Don't know if he noticed me, but one shot was all I got before he turned around and start eating his meal. All camera sounds OFF, 432mm zoom, spot metering, F3.3, 1/100s and ISO200. Our last day in Luang Prabang we were strolling down the Morning Market. A good place to go for food and entertainment. There are hundreds of temporary and semi-permanent shops, stalls, and blankets spread on the ground, where everyone buy and sell almost anything. Here the hill tribesman or woman comes face to face with the modern western traveler in a milieu strange to both of them. But nonetheless the strangeness seems to handle with a broad smile. Inside the market I caught a glimpse of this old man. Later I realize, looking at his dirty clothes, he must have been homeless. He was just receiving a free meal from a local market restaurant. It was the first homeless we saw in Laos. I guess there are more homeless in Amsterdam than in Laos. 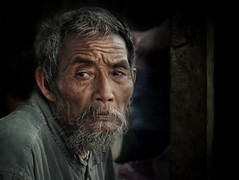 Although Laos is a poor country, being homeless is ofcourse another story. But let's not forget a generation of War and the Politburo of the Communist Party who came to power. In 2005, the United States established Normal Trade Relations with Laos. Looking at his intriguing face I'm sure this man have quite a story to tell.